The history of Charles de Fère is the story of one family’s love of good food and passionate commitment to the best traditional sparkling winemaking methods. Born into a long-established Champagne winegrowing family, Jean-Louis Denois opened a sparkling winery at Fère-en-Tardenois, to the North-East of Reims in 1980. His idea was to create a Boutique winery to make exceptional sparkling wines based on five generations’ savoir-faire and skills. A few years after its foundation, the Charles De Fère name was praised by Press and wine lovers as one of the most qualitative sparkling wine producers. Robert Parker, Wine Advocate said “Exceptional value…compares most favorably with most French Champagnes”. Base winemaking is a specific art, requiring specific grapes profiles. To find the best ones they don’t limit themselves to a specific region but explore the best expression from all French vineyards: the Loire Valley, Charente, Beaujolais, Languedoc, Gers and Burgundy are just a few examples of the terroirs they source their base wines every year. Mother Earth offers us more than 1500 grapes varieties and Charles de Fère likes to ask, “Why should we limit only to the 3 most known for sparkling wine?” Depending on the vintage and wine, their selection includes more than 20 varieties. Among them, Pinot Noir, Grenache, Chardonnay, Merlot, Muscat à Petits Grains, Gamay, Aligoté, Canernet to name a few. 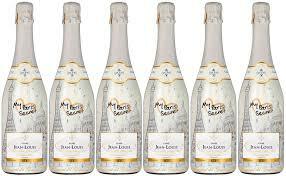 Their base wines are made specifically for producing their sparkling wines and nothing else. The freshness and elegance they want to find in their range start there. To capture this freshness, the first fermentation takes place at a low temperature in temperature-controlled vats. This brings perfect minerality, structure and depth to their final blends. Blending is a key step in the process. It is now that their meticulous selection of base wines makes the uniqueness of their style. Carefully blended, they will bring the subtle nuances to each cuvée. There is no guru there, just a team of passionate craftsmen who bring their knowledge and experience to perpetuate this ritual from year to year to achieve the style they seek for each of their cuvées. They know for fact that making qualitative sparkling wines requires time and patience. The finesse of the bouquet and the elegance of the bubbles do not come over a short period of time. Depending on the style they aim at, their cuvees are aged from 3 to 36 months. They always do more than required to bring out the very best. Dosage is generally the final touch. This consists in the addition of a liqueur d’expédition: a secret recipe resulting of years of experience and especially prepared to preserve the wine’s integrity and aromas. It determines the dryness/sweetness of the wine (Brut, dry, demi-sec etc). Their Gamay and Muscat are the only exception to this dosage step: their sweetness comes exclusively from the residual sugar of the grapes. Happy Harry’s brought in the Charles de Fère Jean Louis Ice Cuvee Blanc de Blanc. This cuvee has expressive notes of candied fruit, white flowers and a hint of citrus on the nose. It is slightly sweet that reveals flavors of fresh white peach that ignites it’s dynamic and fruity personality when poured over ice. Enjoy as an aperitif or for any casual or festive upcoming occasion! Put bacon slices in a bowl, season them with pepper and toss with the brown sugar. Cover a baking sheet with parchment or foil and arrange the bacon in a single layer on top. Sprinkle any sugar left in the bowl over the bacon. Top with another layer of parchment or foil and top it, squarely, with another baking sheet. The baking sheet will flatten the bacon as it cooks. Place the tray in the center of the oven and bake for 20 minutes. Check the bacon by lifting the top tray and parchment. If it is not golden brown and fairly crispy, resist the temptation to turn up the oven temperature, and cook it for 10 to 15 minutes longer. Check it again. 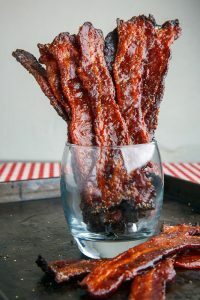 Keep in mind that when you remove the tray and transfer the bacon to a serving platter or individual plates, the bacon will “crisp” up a little more. Be patient!